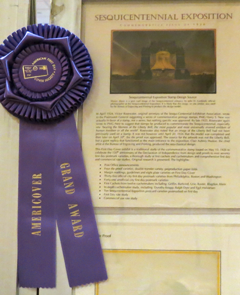 Charles J. O’Brien III received the Claude C. Ries Chapter Grand Award at Americover 2012 for his exhibit U.S. Sesquicentennial Exposition. 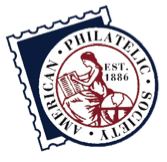 By receiving the Grand Award, O’Brien’s exhibit becomes eligible for the Champion of Champions competition at the 2013 APS Stampshow. O’Brien scored again by picking up the Reserve Grand and the Richard B. Thompson Award for New York World’s Fair 1939. Best single frame exhibit and the Curtis B. Patterson Award went to Eliot Landau for The 1909 Lincoln Commemorative Issues: Early Uses and First Day Covers. Jay Bigalke picked up the Marge Finger Award for most popular exhibit with Springfield USA, a study of the 2009 Simpsons issue. The AFDCS thanks the jury of Chief Judge David McNamee, Peter Martin, Stephen Suffet, Alan Warren and Anthony Wawrukiewicz.